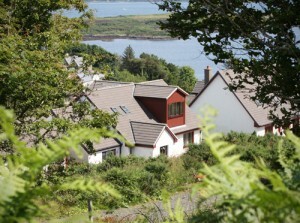 The Croft | Tobermory Isle of Mull The Croft Self Catering, Tobermory, Isle of Mull, Argyll. The Croft is a modern home sleeping up to 8 with a fantastic outdoor terrace. This is a luxurious property offering spacious accommodation with quality furnishings and attention to detail. With its peaceful setting in Upper Tobermory, and excellent views, this is a superb choice for a family holiday in Tobermory.